In 1630-31, the plague devastated Venice. One third of the population -- 95,000 people -- died during the outbreak. In October, 1630 as the plague had Venice on her knees, the Doge and the Senate vowed to make a holy processional each Saturday for fifteen weeks. And he also promised to dedicate a church to the Virgin Mary as a plea for her help. Soon thereafter the plague outbreak broke, and the people of Venice set about to fulfill the promise. 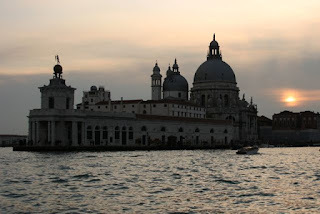 Construction on Santa Maria della Salute -- St. Mary of Health -- took half a century. The architect, Baldassar Longhena was a young man of 26 when he won the project. He devoted his entire life to building the church, and lived to see its completion, dying a year later. Longhena was very lucky because the site the Venetians chose for the church makes Santa Maria della Salute one of Venice's icons. Why this church out of the hundreds of churches in Venice? 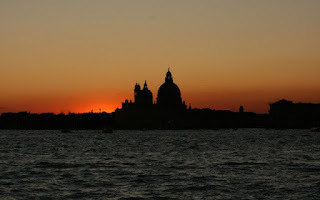 Because the sun sets right behind Santa Maria della Salute making it the subject of hundreds of paintings and photographs. The light in Venice is different every day. Situated right on the sea with the Dolomites not far inland, Venice's weather changes frequently. And the water, always moving, reflects light in so many ways. Artists never tire of the changing light in Venice. Claude Monet who spent his whole life exploring light on canvas visited in 1908 and was "gripped by Venice." So, how is it that Venetian light changes so much? 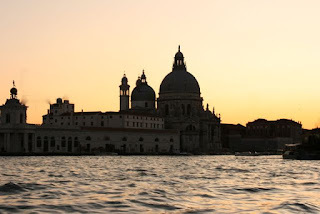 Consider Santa Maria della Salute. 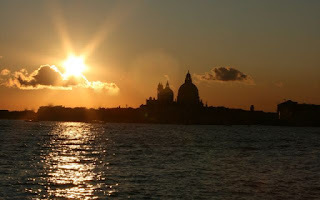 All of the following photographs were taken of Santa Maria della Salute as the sun was setting -- one on each of five consecutive evenings. They were all taken within 30 minutes of each other. Admittedly they were not taken with exactly the same settings, but even given that, consider how different the quality of light was each evening. Venetians worship regularly at Santa Maria della Salute, and the church itself is gorgeous on the inside, too. It continues to be a place for pilgrims as well. Each November 21 a procession is made to the church where residents give thanks for their health and pray for their well being and that of their family and friends. And Baldassar Longhena's monument to Mary and a restoration of health serves as both a solemn reminder as well as a gorgeous adornment in the city of Venice. Thanks to those of you who joined me for Photo Friday! Check out more photographs at DeliciousBaby.com. What a photogenic spot in any light! This is one of your best posts! Great idea to show the photos from different days and times. This changing, reflective light in Venice, as you well know, is one of the factors that made venetian art develop so differently than that of the mainland. These are some of the loveliest sunset shots I've seen, like the silhouettes you have going on here. It is interesting how religion influenced art. Good post. JUST gorgeous. your photographic talents continue to amaze me! Fascinating to see how much the light changes from day to day. Monet himself couldn't have done any better! One thing that always strikes me about the light in Italy is that it looks old. Perhaps its just pollution, but the romantic in me wants to believe that it has something to do with the layers of history and devotion that are in the air. I love Photo Fridays! This one is particularly beautiful. 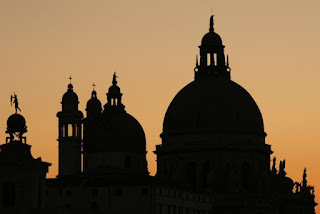 What a fantastic display of Santa Maria della Salute at sunset! I love the silhouettes in the first photo and the sunset in the third photo in particular is breathtaking. Venice! You have caught it so well! I have been there a number of times, could go back any time... Just love it!